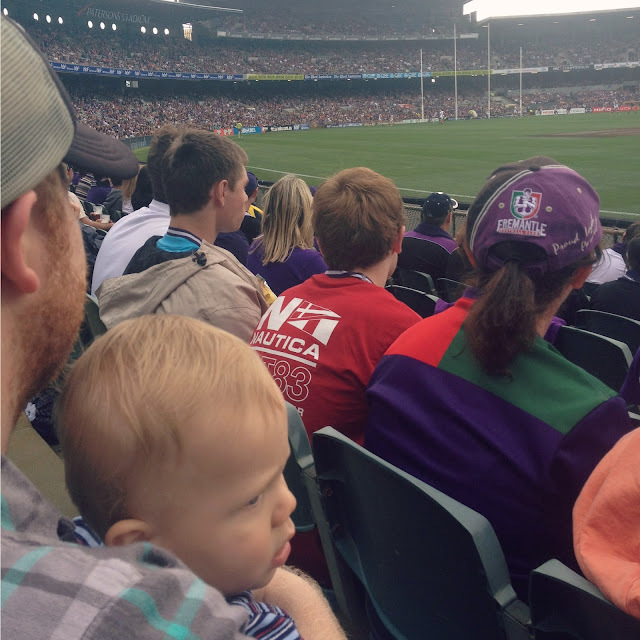 Has anyone else tried taking an infant to a AFL (Aussie Rules Football) game before? I have a feeling it is not that common. Mostly because I didn't see any other babies at the game, and I received a few 'you're brave' type comments from other patrons. I admit it was a bit of a risk, and we weren't sure how it was all going to turn out. 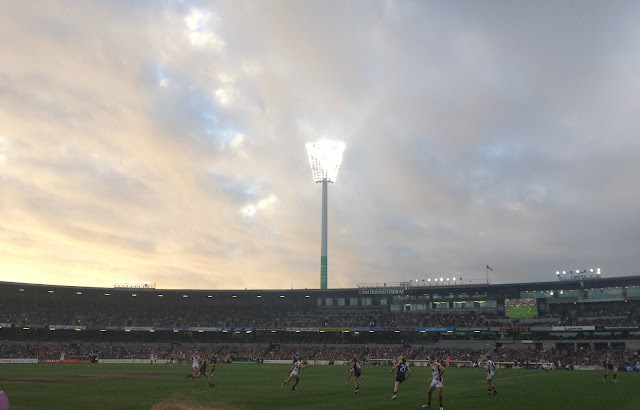 We were prepared for the worst, and it wasn't actually bad at all, in fact it was really fun, admittedly I didn't actually watch much of the game, but it was still a fun day out. 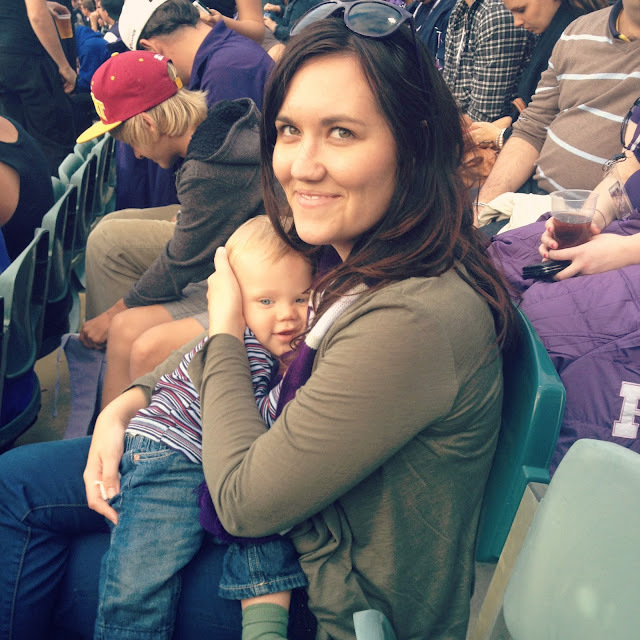 For Christmas Joel decided he wanted a Fremantle Dockers Membership, but of course that meant me getting one also, and then of course getting one for the little man. Some of the earlier games in the season were too late in the evening and one time we were all ready to go and then the kid refused to take a nap, so there was no way I was taking a no nap baby to the game so Joel took other people along to the games Finally, the stars aligned and we were all able to go. Because parking near Patersons Stadium is difficult, we had an extra challenge of a train ride in and back, and just to make it more fun you can't take prams into the stadium. This is ok with us because I love my Ergo baby carrier, but it just meant one of us would be holding Ez the whole time. The stadium is actually not set up very well for infants or toddlers. I was nicely surprised to find a change table in the disabled toilet close to our seats, but unfortunately they do not have a parents room. So what do you do if you want/need to breastfeed your baby? I could have tried in our seats, but it would be impossible with an overly distracted baby. So what choices did I have left? Not many, I ended up heading to the disabled toilet in hope that they had a chair or something. No such luck, good thing I can stand and feed, not the best option, and can I just say, ugh, breastfeeding in a disabled toilet is not nice, but it did the job. It was pretty disappointing that they don't have any facilities, but why am I really surprised. At least they had a change table, but I would not be opposed to changing him right in the hallway if they didn't, just to make a point. In the first quarter the cheering of the crowd gave the little man such a fright, he started crying every time people yelled out or the crowd cheered. Gradually he got used to it and just tucked his head into me and I covered his ears and one point I think he may have fallen asleep. It isn't very often I get cuddles anymore, my baby boy doesn't sit still enough to give cuddles, so selfishly I was really enjoying him being a little scared because I got so many lovely cuddles. The train home was the most challenging. So many people pushing and trying to get on an already full train. Lucky for us Joel was able to grab hold of a railing and plant his feet to protect us, he then yelled out for everyone to stop pushing because their was a baby on board. From then on, everyone was very helpful, after a couple of stops someone even offered us the 'priority' seat.